The smarter technology becomes, the smarter we can be about regulating the temperature in our homes. Thermostat control would be easy if we never left the house, but we do. We leave to go to work. We come home. We go to bed. Weekends are different, and sometimes we leave for days on end. Yet we still expect to feel comfy when we are there. That said, no one wants to pay for too much comfort or for heating and cooling empty rooms. That’s why your thermostat is your BFF when it comes to temperature control. With the right thermostat, you can be perfectly comfortable all the time. Do you still manually set and reset your thermostat every time you leave and come home? If so, you shouldn't be! Programmable thermostats save time, and they ensure consistency — the foundation of comfy. You can set different temperatures for different parts of the day and separate days of the week, choose alternative settings for longer vacations away, etc. Set and forget. Higher-tech thermostats now incorporate smart technology that allows you to monitor and change settings remotely or even track your energy usage. Some learn from the changes you regularly make and automatically adjust themselves in the future. And, of course, there are models that integrate seamlessly with your whole-house smart system. That’s not only efficient, it’s fun. Ultimately, you want to be comfy, or "just right," as Goldilocks said. Warm but not suffocating in winter, cool but not frigid in summer. That’s a matter of personal preference. But keep in mind that, while a degree or two may have little effect on your comfort, it can have a noticeable impact on your energy costs. We find that most people are happy setting their thermostat at 68-70 degrees in winter, around 72-76 degrees in summer. You may have heard that you shouldn’t let the temperature in your house fluctuate too much because your furnace or air conditioning will have to work overtime to re-heat or re-cool the space. Not true. The more you lower the temperature (in winter) or raise the temperature (in summer) when you’re away for at least eight hours, the more you save. About 10% off your energy bill for each degree. So, go for it, your furniture won’t care if it’s overly warm or cool. Do the math, and think about what you could do with that extra money. Your thermostat will be confused if it is mounted where it experiences sun, a drafty breeze, heat from your kitchen or fireplace, etc. To avoid an inaccurate thermostat reading, keep it away from doors, windows, and air vents. The best thermostat placement is in a central location of your home, on an interior wall, and mounted 52-60 inches above the floor. 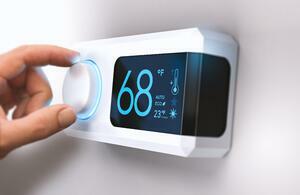 Thermostat control starts with you. Even if you opt for the smartest high-tech controller on the market — one that can communicate with you from far away and adjust itself on the fly — it’s still up to you to identify and set your ideal temperature for different days and times. Once you show the way, your smarty pants thermostat can take over the “heavy lifting” of keeping your home comfortable.